I don’t know about you, but am a little bit relieved that the Month of April is over. Don’t get me wrong, I really enjoy the #AtoZChallenge but it can also be a very demanding challenge. I am more than ready to return to a reduced schedule of posts, so that I can take more time to enjoy them as well as your posts, too. A hearty thank you to Mr Arlee Bird, founder of the #AtoZChallenge, who started this annual trek through the blogosphere all those years ago. I don’t know if I’m just getting older, but keeping up with the posts daily, as well as promoting them via social media, and keeping up with all my friends -PLUS some new ones - just made me tired. Yes, you heard me. This old broad is ready for a NAP! I truly enjoyed making new acquaintances this year, as well as re-confirming friendships from years past. My original thought for my theme this year was just going to be random songs from the 70’s decade. But once I got into the nitty gritty of it all - I realized that the 70’s had a vast range of genre, and I knew I wasn’t going to be able to make everyone happy. So, I took a safe route and went with Billboard Hits, based on the Billboard Hot 100 Year-End Charts. I was able to get a nice cross-section of genre using this method. I got lucky, as there were only three letters that did not appear on those charts - but I was able to find songs that were released during that time period for each of those three letters. In 1977, Barry Manilow released the song ‘Looks Like We Made It’. The song was composed by Richard Kerr with lyrics by Will Jennings. When the song was released, it reached number 1 on the Billboard Hot 100 as well as the US Adult Contemporary Charts. By the end of the year, it was listed as number 37 on the Billboard’s Hot 100 Year-End Chart. And there we have it folks! 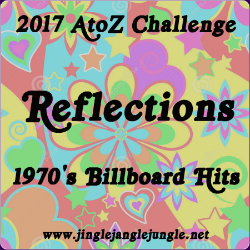 That’s a wrap for the 2017 #AtoZChallenge . Will you be joining us again next year? I plan on it - simply because I love music and sharing the stories. I appreciate that. I enjoy the playlists so much. Can't tell you how many times I've listened to the previous years challenges the past few years. Makes for nice background music, and sometimes I'm able to find inspiration for additional posts. I learn as I go... It's part of what makes it fun. Impressive work indeed! I truly did enjoy your run this month, it brought back so many memories from my own childhood. :) And I'm so impressed that you were able to fill in all the days! Way to achieve! Lot of fun following your challenge and looking forward to more great artists! If there's any that you want to know more about, just let me know. I cover all the genres and any decade. It was fabulous, Mary! Really proud of you! Especially your crack of being an "old broad"! You realize you provided me for years of ammunition, right?! Anyway, when I was a teenager, and backpacking in Oregon with my dad and brother on a 10-mile strenuous, uphill trip, the song "Looks Like We Made It" got stuck in my head, and actually spurred me on. You deserve that well-earned rest, Mary, but I look forward to future Jingle Jangle Jungles! Love ya Mary! I'm not worried about all those years of ammunition. See, knowing that you are older than I am, I am sure your short-term memory will kick in and you'll have forgotten about this in about an hours time. Hey, I met a lady tonight that grew up in Eden back in the '40s. I have already forgotten her name, but I instantly thought of you Valley High boys. Thanks for stopping in and your continued support and long-term friendship. Love ya right back! I think you did a great job too, and I'm so glad I met you because of our music. Have a wonderful weekend. I'm glad that we met as well. I'm looking forward to some great Monday Music! GAH! I want to participate in this challenge and keep missing it! I'm making a note in the back of my planner to remind myself about it in March! The best way to remember is sign up for email notifications at http://www.a-to-zchallenge.com They usually start posting reminders in late January. We must be in the same age range. There haven't been many top 40 tunes you posted that I didn't recognise. I am proud to say I am a Fanilow :) I remember both of these songs getting a lot of attention. Good music is timeless. I was a kid/teenager during the 70s. The earlier music was fresh in my mind thanks in part to my older siblings. Ole Barry; clean songs sung simply but with grand orchestration. The wonderful/odd thing about him was we teens liked his tunes and so did our mothers and grandmothers! So glad you made it! It wore me out, too, this year, but I did much more visiting and reading this year also. I thought the song was a perfect way to end the challenge. Another year in the books! Thanks for stopping in! I so enjoyed your A-Z, the ones I managed to visit. Brilliant. Congratulations on completing the Challenge! You had a fun theme for the month--it was like a variation of Battle of the Bands every day! Glad you made it and thanks for being a part of it all. I certainly had a good time with this theme. Not sure how I'm going to top it next year, but I'll think of something. I enjoyed your theme a lot, Mary! 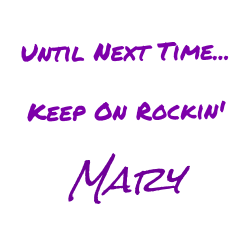 ☺ Like you, I'm pretty worn out at this point and will be posting sporadically for awhile. Still haven't caught up with all the comments, but that's a good problem to have. Debbie, it used to take me just a matter of a few hours to put together a post, but I've been working on a post for this coming Thursday for the past two days and I'm not even close to it being ready to publish. I'm accustomed to having posts ready at minimum a full week in advance, if not more, but I've been so tired lately, I can't even think straight. Thank you for your many visits this month. I look forward to you joining us for battle of the bands again soon. I've so enjoyed your friendship and support though the past few years. I was born in 1965, so these songs are all part of my growing up years. In many ways, I feel somewhat like your baby sister. I was 10 in 1975 when my sister married. Enjoyed your challenge posts as well! I have only just heard about this challenge! Sounds like a lot of fun. But a lot of commitment too. lol Great job! And <3 the music! This is an annual event. I highly recommend visiting http://www.a-to-zchallenge.com and signing up for email notifications so that you can join us next year. Lots of great themes. Life does have it's way with doing that. Hope all is well with you. I had no idea that this challenge existed. This is the first time I am hearing about it. What a cool playlist though. You should check out http://www.a-to-zchallenge.com for more information. Mark your calendar for April next year and join in the fun! I hope that you do participate again. I find it rewarding knowing that I've been able to finish the challenge each year. Each time, I learn something new. I originally wasn't going to have a closing song, but this one just popped into my head. Did a little research, and sure enough it was also on the Billboard Hot 100 Year-End charts. It just worked out in my favor perfectly. Lol! You did a great job Mary! I've enjoyed your A to Z Challenge and I haven't even finished reading all the posts yet! I love hearing songs from my childhood in the 70's and yes I agree, there were a lot of genres back then too. I've thought of one category that might want to be visited and that is the one of country/pop crossover hits. There's several artists who may have been known as country artists who had huge hits with songs that made the Top 100 Billboard charts. Artists such as Eddie Rabbit, Ronnie Milsap, Dan Seals (of England Dan and John Ford Coley fame) among others had huge hits in the 70's and 80's that were on both country and pop charts. Anyway, I'll get to those remaining letters of the challenge soon! Thank you for the suggestions! They will certainly come in handy. I saw Ronnie Milsap in concert in the very early 80's, and I like each of your suggestions. Enjoy the rest of the posts, and don't be shy about visiting the non-AtoZ posts as well. Sounds like your theme was a lot of fun. The theme was indeed a lot of fun! Be sure to check out the individual posts. Lots of good information, and good music!